Nick Bremigan was 1965 graduate of the University at Buffalo with a degree in history. 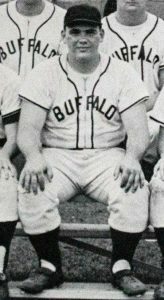 He was also a member of Buffalo’s varsity baseball team as a catcher. Nick was on the 1964 Buffalo team that made it to the NCAA College Division Atlantic Region tournament played at the original Yankee Stadium in the Bronx. After graduating, Nick began umpiring in the Minor Leagues in 1969, and umpired in the Minors until 1973. From 1974 to 1988, Bremigan umpired in the American League, working 2,122 regular season games. He officiated in the 1980 World Series and in the American League Championship Series in 1977, 1981, 1983 and 1986, serving as crew chief in 1981. He also worked the All-Star games of 1979 and 1985. Bremigan may be best remembered by baseball fans as a member of the 1983 crew that worked the ‘Pine Tar’ game between Kansas City and New York on July 24. The umpiring crew disallowed a ninth-inning home run by Kansas City’s George Brett because Brett had too much pine tar on his bat. Sadly, Nick died of a heart attack in 1989 at age 43 in Garland, Texas. 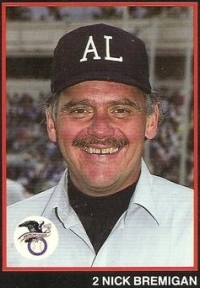 American League umpires wore his number 2 on their sleeves in his memory throughout the 1989 season. For more information on baseball at the University at Buffalo, visit the UB Sports History Collection website.